Time is running out for the human race! "Uh, about all I can tell you now, could be looked upon as ancient history. When the monsters first appeared, they meant to destroy the Earth." ~ Dr. Yoshida, in Titan Productions' dub of the film. The ninth Godzilla film and originally set to be a Grand Finale (though remains this chronologically for the original series). The last time Tomoyuki Tanaka, Ishiro Honda, Eiji Tsuburaya, and Akira Ifukube collaborated together on the franchise, and entitled Kaijū Sōshingeki ("Charge of The Monsters"). The year is 1999, where the world has corralled all the world's monsters into a heavily secure island base in the Ogasawara archipelago called Monsterland and a new Moonbase is being established with the brand new rocket ship Moonlight SY-3. However, things go awry when Monsterland is suddenly gassed by aliens and both the monsters and humans are brought under the control of a group of space women known as Kilaaks. They've made the Monster Island crew into henchmen and have sent the monsters around the world with Godzilla attacking New York, Rodan to Moscow, Gorosaurus to Paris, and Mothra to Beijing. It is up to the crew of the Moonlight SY-3 to sabotage the Kilaak control device, while the monster attacks intensify and the Kilaaks plot to make things more comfortable for them by raising the temperatures. Upon their success, the monsters rally to attack the Kilaak base at Mount Fuji, but the Kilaaks pull another card from their sleeves: King Ghidorah, leading to a climactic showdown for Earth. Advertised Extra: While the film does feature a huge number of monsters, most of them only appear for a few seconds each. In fact, the majority of the film bar the very end has only very brief cuts to monster action, with the focus being on the humans trying to thwart the Kilaaks' control over them. Affably Evil: The Kilaak leader. All Your Powers Combined: TEN monsters vs King Ghidorah. Geeze. Though to be fair, only six really do anything. The Alcatraz: Monsterland is basically a prison for Toho kaiju. Blood from the Mouth: King Ghidorah during his battle against the Monsters. This should be noted that Eiji Tsuburaya, the SFX supervisor of the film has quote several times before that he'd ''never'' have Godzilla or any of the monsters in Toho bleed... though this is perhaps because his protege Sadamasa Arikawa did the actual directing. Bizarre Alien Biology: Though the Kilaaks appear to be merely Human Aliens at first glance, they can only take that form while remaining at high temperatures, their real forms being more like metallic slugs. Brainwashed: The poor workers of the Monster Island facility. The main characters had to kill them without realizing that they were being mind-controlled Mooks. Characterization Marches On: Remember that this Godzilla is from Godzilla Raids Again? The next several films made him even more... wackier. Cool Starship: The Moonlight SY-3. Didn't Think This Through: As a final ploy after all the Earth's monsters break free of their control, the Kilaaks send in King Ghidorah to kill them all. You know, the one who took Godzilla and Rodan alone to defeat him in his last appearance, and now he's up against Godzilla, Rodan, and FIVE other monsters working together (technically ten, but Varan, Baragon, and Manda never end up doing anything but spectating). You start to wonder if the Kilaaks were really so idiotic that they thought King Ghidorah had a sure victory despite this, or they were just bluffing at that point. Earn Your Happy Ending: The humans earn their right to continue to exist by destroying the alien mind control devices and the Earth monsters earn their right to live the rest of their days in peace on Monster Island by killing the world destroying King Ghidorah once and for all. 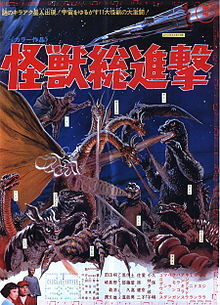 Extreme Mêlée Revenge: Once Earth's kaiju manage to ground King Ghidorah, they proceed to literally beat him to death. Given every appearance of his has had him viciously assault any monster opposing him and he's wiped out entire planets for fun, it's hard to blame the kaiju. Foregone Conclusion: This is this the chronological final film in the Showa Era. Meaning everything happening after this film will be set up with this one. Such as King Ghidorah appearing in Godzilla vs. Gigan. The Great Politics Mess-Up: Averted. When Rodan attacks Moscow, no mention is made of the Soviet Union. Humiliation Conga: For King Ghidorah. Killed Off for Real: King Ghidorah is finally killed by Earth's monsters. This is the Showa King Ghidorah's canonical death, all later appearances are set before this. Monumental Damage: With this many kaiju and locations, it's inevitable. Mythology Gag: Rodan was written as an allegory for the Soviet nuclear threat, so Rodan attacks Russia. Newscaster Cameo: For the umpteenth time in a Toho sci-fi film (Look carefully, his cameos go as far back as the original film), Japanese news reporter Saburo Iketani appears as himself, even though the film is set in 1999. Maybe it's his son? Nice Job Fixing It, Villain! : While King Ghidorah bites Anguruius and causing him to fall, Angurius's fall causes an earthquake that uncovers the Kilaak's base. No-Holds-Barred Beatdown: The battle with Ghidorah turns into this towards the end, culminating with Godzilla and the others mercilessly stomping Ghidorah's brains out. If you look carefully, blood spurts out of Ghidorah's mouths. Pay Evil unto Evil: King Ghidorah's death is brutal, but considering the guy liked to destroy planets for fun, he had it coming. Reality Ensues: No matter how much of a badass you are, being outnumbered still isn't good. King Ghidoarh, the most badass of Toho's evil monsters, finds himself outnumbered by all of Earth's monsters. Although it must be noted that a lone bear can defeat a pack of wolves so the numbers thing doesn't always work in real life but numbers can be a very good factor in a fight. However, in this case this includes three monsters (Godzilla, Mothra, and Rodan) who Ghidorah was beaten by in his first appearance, now with a lot of back up, so his death is to be expected. Series Fauxnale: The film was intended to end the series, but it proved to be so popular that more films ended up being made. Though it should be noted, chronological, this film is still the ending of the Showa Era timeline. Time Skip: All of the other Godzilla movies were set in the time that they were made (or in the vague "near future"), but this one is set in the then-future year of 1999. Truth in Television: Rodan is shown diving into the water to catch dolphins, fossil evidence seems to indicate that real Pteranodons would hunt this way as well. Ultimate Showdown of Ultimate Destiny: Brought together most of the players in Toho's Kaiju Universe (With the exception of Dogora, the Gargantuas, and King Kong) for an Epic Battle For The Fate of Earth. Unexplained Recovery: Anguirus' jaw must have healed some time between Godzilla vs. Mechagodzilla and this movie. Destroy All Monsters was made first, of course, so perhaps Toho just forgot about that detail when making the former film. Or the jaw breaking healed and made him come back stronger. Vichy Earth: What the Kilaaks want to turn Earth into. Zeerust: Even for its time, the aliens seemed dated with their all-silver suits and 50's style saucer ship.